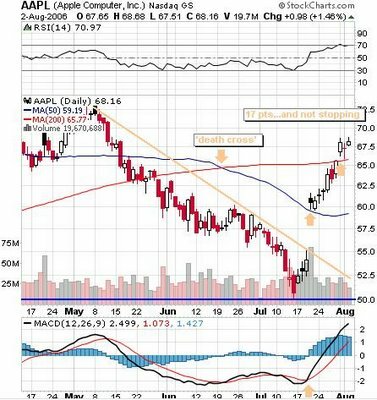 What looked like a breakdown in the making with AAPL (50 was major support after all) may turn out to be the year low as technicals got thrown out the window in one afternoon along with the shorts (and more shorts at 60) on no real news (again). I would've guessed the one tech volatile enough to do that was GOOG and not a trender like AAPL. But the trend for both of these was always up and that still hasn't changed (yet). Earnings, earnings and more earnings.